So, you know what's funny? Not funny ha-ha, but funny curious? I've shared tons and tons of recipes, talked about almost as many books, movies, and tv shows, and mentioned bits and pieces of my everyday life here on the blog over the past 7+ years, and yet, I've never featured many of the most constant parts of my life. One example—the recipe for the one pasta dish that will please every single member of my family, every single time I make it. I know it's because I usually wind up making it later in the day once all of the natural light has faded, therefore I don't wind up taking any photos. I always think "next time" to myself. Another example—Supernatural. It's been one of my favorite tv shows for what, almost 11 years now! And yet, no posts specifically dedicated to the cast and writing that makes up the fabric of my daily life (no joke, if I'm home in the mornings...which I am most mornings...Supernatural episodes are usually on the tv as background noise). Unless you count the fact that Dean's handsome mug graces my #FridayPieDay page, that is. There are other similar beloved recipes, family stories, movies, books, music, and television shows that I hope to get around to sharing with you one day, but I'm going to work my way towards remedying my lack of Supernatural-inspired posts immediately. I figure, what better day to jump in with both feet than (season 11) finale week! It begins as Sam wakes up in a motel room to "Heat of the Moment" by Asia playing on the clock radio alarm and Dean already up, getting dressed, and telling him to rise and shine. 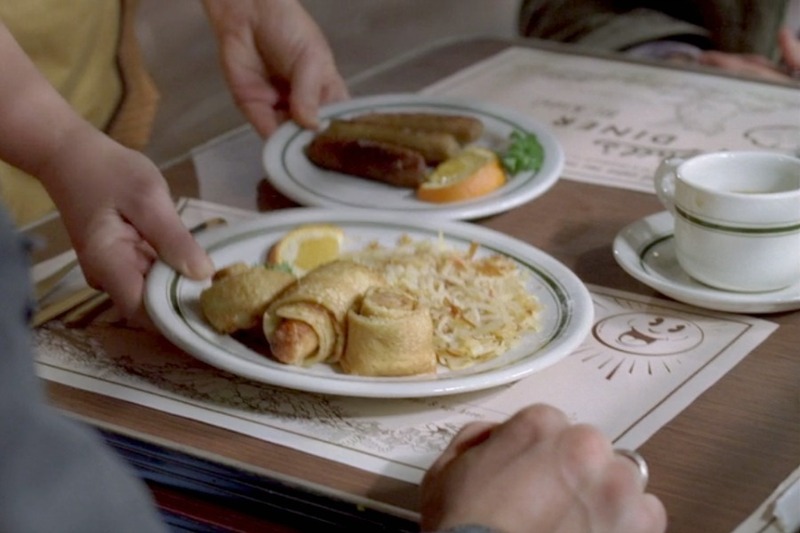 Dean goes through a long and irritating (to Sam) morning bathroom routine, and they go to the local diner for breakfast. 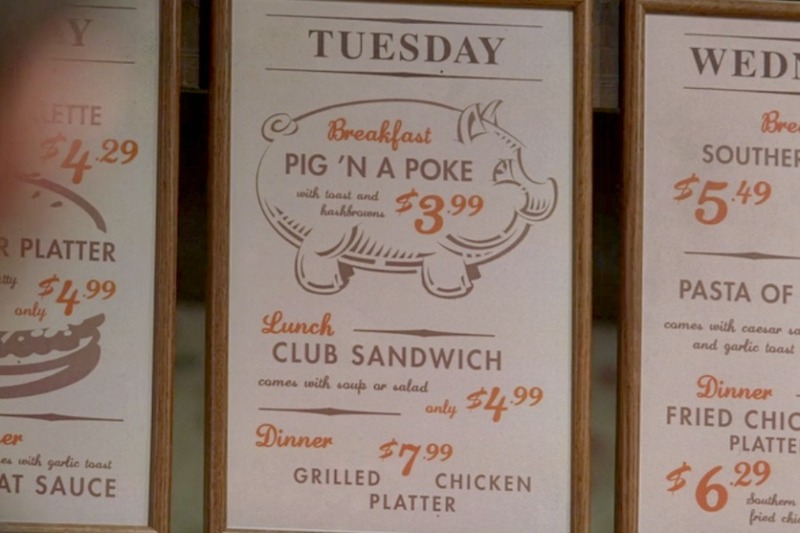 In his usual adorable, hungry way, Dean gets excited about Tuesday's special "Pig 'n a Poke", which he orders with a side of bacon. They set about their routine of discussing the case that brought them to Broward County, a man disappearing at the Mystery Spot. At one point in the case, Dean dies...and the next thing we know, the radio is playing Asia and Dean is telling Sammy to rise and shine again...like Groundhog Day. Tuesday happens over and over again, each one ending with Dean dying in a different way. 100-ish Tuesday's later, Sam notices a discrepancy in the daily routine and they realize that there's a Trickster at work. Does Wednesday ever come? You know it. It may have been hell for Sammy, but I know it made Dean happy eating (and saying) Pig 'n a Poke with a side of bacon each and every time. 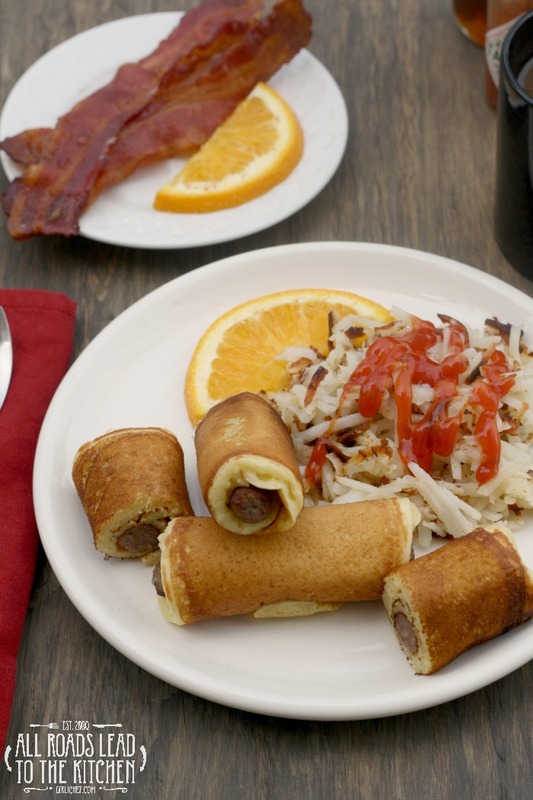 Pig 'n a Poke is basically a pancake wrapped around breakfast sausage. Yeah, yum. I used my family's trusty buttermilk pancake batter recipe (yet another much-loved-and-used recipe that I haven't shared with you) and modified it slightly to make my version of this Tuesday special. Phew, I did it. I finally shared a Supernatural-inspired recipe. Now, my plan is to share at least one recipe from each of my personal favorite episodes...plus at least another one for every season. That's the goal, at least. If you enjoyed this, head on over and visit my friend Kimberly at Coffee and Casseroles, because she is also sharing a recipe inspired by Supernatural today! Do you have any Supernatural-inspired or themed recipes or food on your blog? Feel free to leave a link to the post(s) in the comments if you do, because I'd love to check them out. 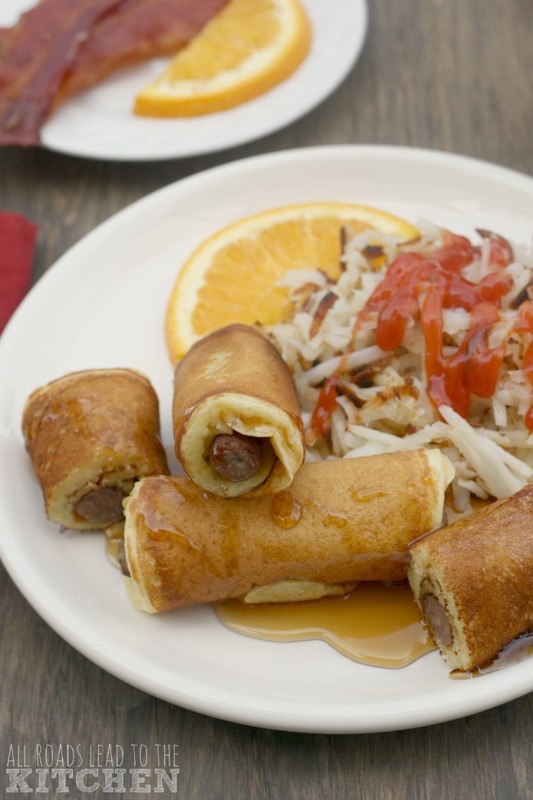 Breakfast sausage wrapped in a tender buttermilk pancake make this favorite Tuesday (or any day) breakfast called Pig 'N A Poke - inspired by Supernatural. Cook the breakfast sausages either in the oven or on your stovetop until completely cooked through. While the sausage is cooking, whisk the flour, sugar, baking powder, baking soda, and salt together in a large bowl. Whisk the buttermilk, oil (or butter), and eggs together in a large measuring cup with a spout (or a bowl). Make a well in the center of the dry ingredients and pour in the wet ingredients. Whisk everything together until just moistened; there will be some small lumps - that's okay. Let sit until the sausage is done cooking. Set the sausage on a thick layer of paper towels to blot grease. Set a cast-iron skillet (or your preferred skillet for making pancakes) over medium heat until hot, then reduce heat to low. Rub a thin coat of oil over the skillet and spread a scant 1/4 cup of batter onto the skillet in an ovalar shape (you can do as many as your skillet will hold without crowding). Set one sausage across the batter, about 1/2-inch from one end. Let cook until the surface of the pancakes have some bubbles that have begun to burst, the edges are starting to look dry, and the bottom is golden, ~1 minute or so. Carefully flip the pancake over (sausage and all) and let cook until the bottom is just set, ~20 seconds. 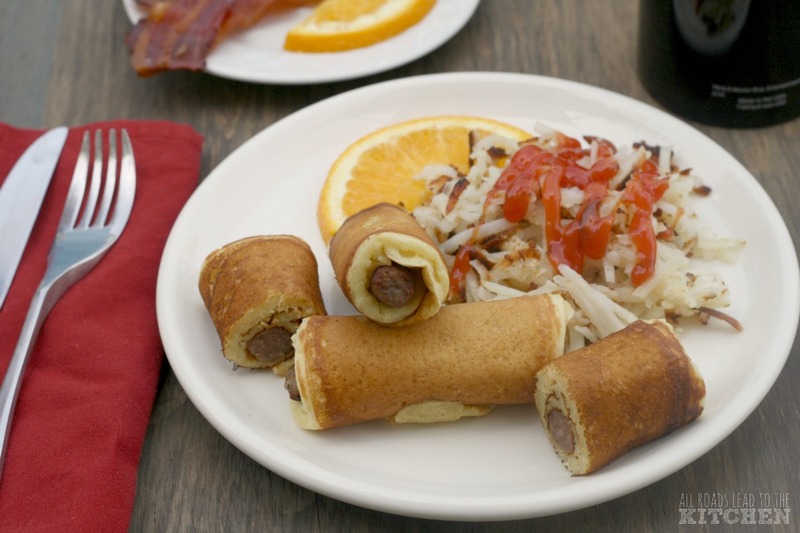 Immediately flip back over and, starting at the end with the sausage in it, carefully roll as tightly as possible. It's okay if some uncooked batter squeezes out the end. Continue cooking until pancake is cooked through, another 30 -40 seconds. Repeat until all of the batter and sausage has been used. Serve the Pig 'n a Poke with syrup drizzled over or on the side for dipping. If you're like Dean, eat it with some hashbrowns and a side of bacon.